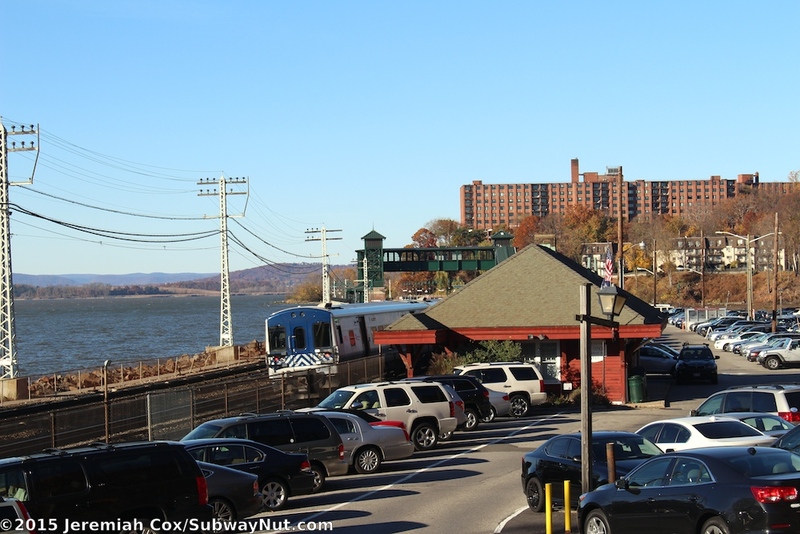 The Scarborough Station was completely rebuilt between 2008 and 2011 (the first set of photos are of the temporary wooden platforms used during the rebuilding) and is perhaps the most scenic station on the Hudson Line with both platforms directly over water. The stop also became ADA compliant during these renovations. 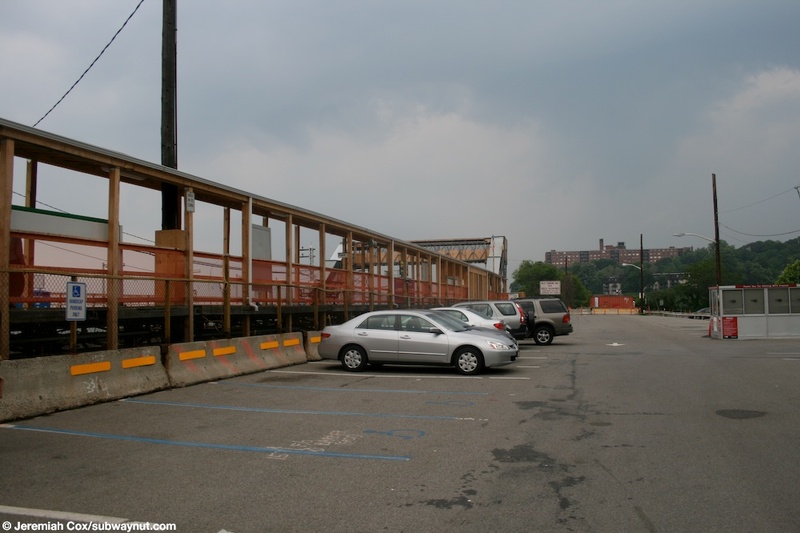 During the reconstruction temporary wooden platforms and a temporary overpass bridge were built in the station's parking lot and directly over track 4 (reducing the Hudson Line to 3 tracks) south of the current platforms. The stop has the normal local configuration of two side platforms that can accommodate 8 cars for the four-track line. 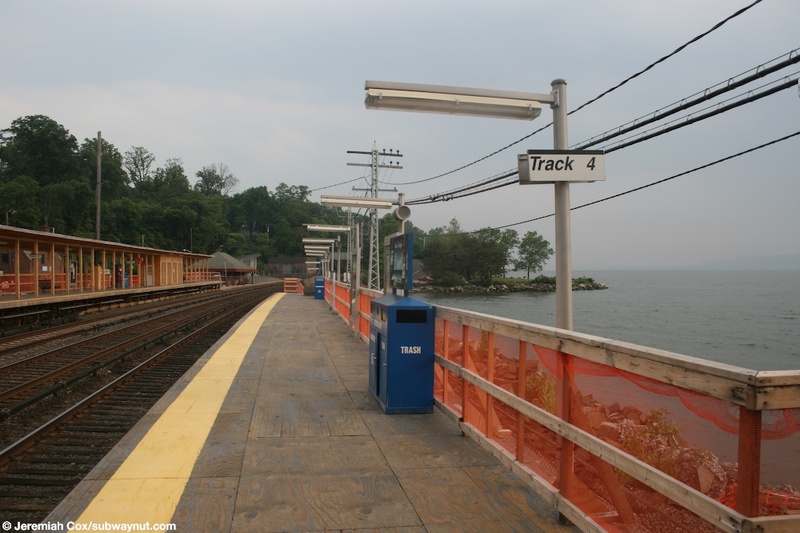 The New York-bound platform hugs the Hudson River while the majority of the northbound platform is also directly over water because of Kemeys Cove. 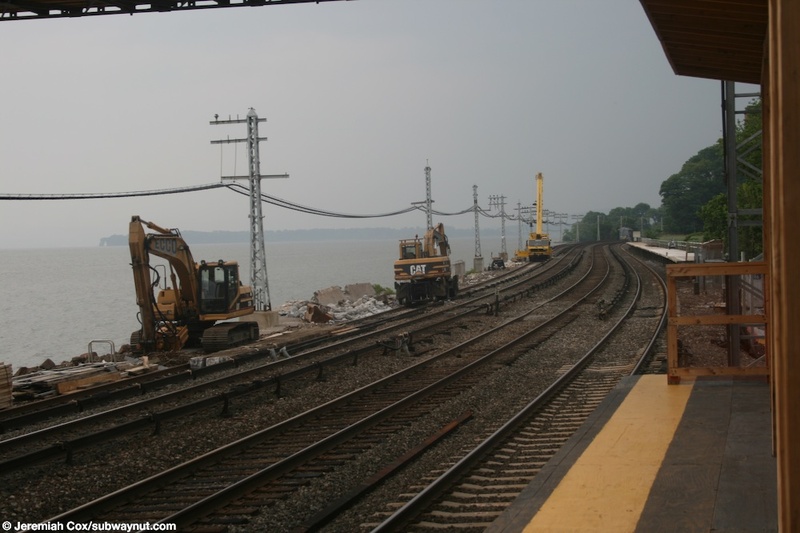 The outlet of Kemeys Cove into the Hudson River runs directly beneath the station platforms. It is a minor, local service station receiving the base minimum of 1 train per hour during off-peak hours. It is the station for the village of Braircliff Manor but is still named for the original community the station is located in. 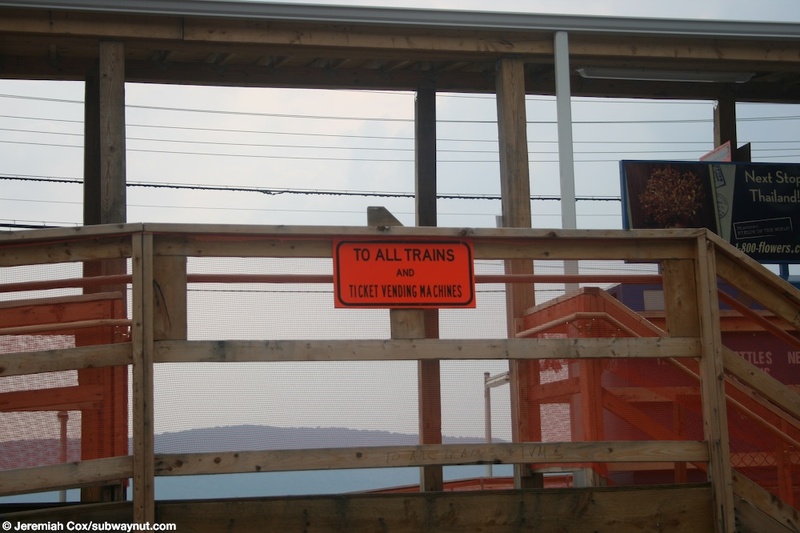 All platform access is at the extreme southern end of the station. Here a pedestrian overpass connects both platforms. The overpass is fully enclosed with doors at both ends and windows. 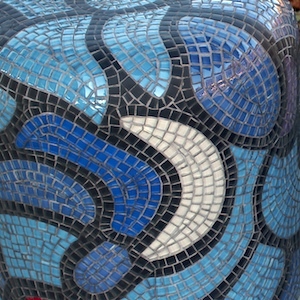 It contains the station's two TVMs. An elevator and staircase lead down to the New York-bound platform with a staircase and elevator down to the station's entrance area just beyond the end of the northbound platform that has a short staircase and ramp providing all access to this platform. Waiting passengers are fairly well protected from the elements at this station; a canopy extends from the southern end for about half the length of the New York-bound platform and a quarter length for the northbound platform. 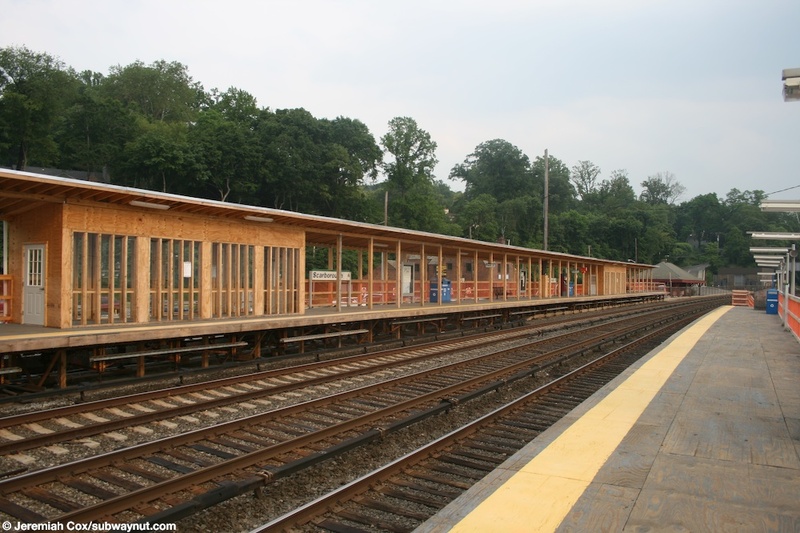 In the canopy area is one enclosed black shelter for the northbound platform and two for the southbound platform. 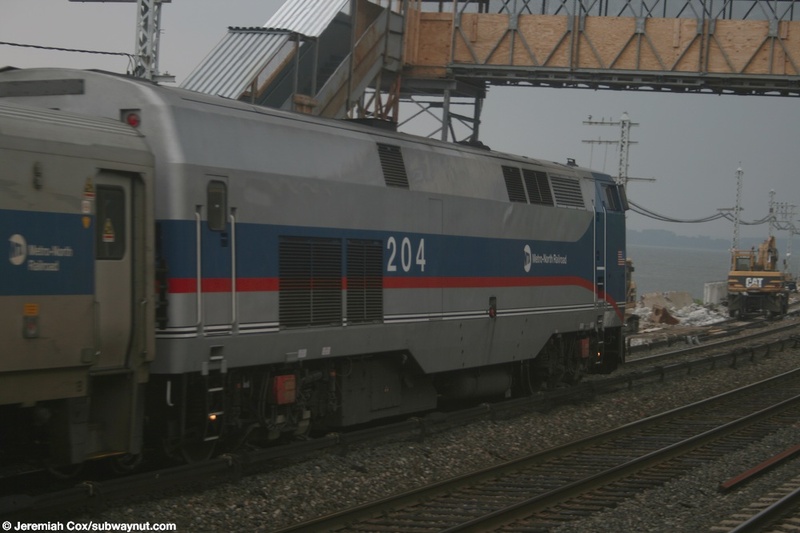 There is a third exit from the New York-bound platform at its southern end via a ramp down to track level that leads to a neat walkway between riprap along the Hudson River and a low fence for protection from the train tracks. 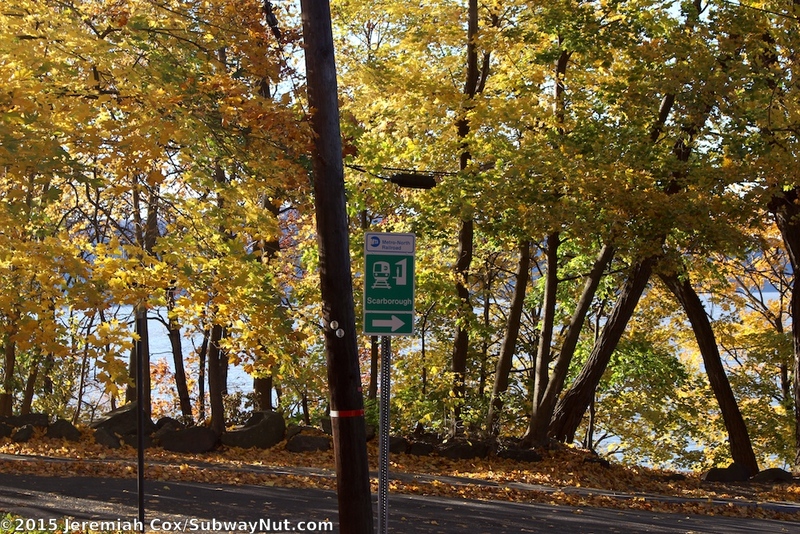 This walkway leads south about 600 feet to Scarborough Park along the Hudson with a small parking area and narrow road bridge across the tracks. Just south of northbound platform is the station's main parking lot. This large parking area has split ownership. 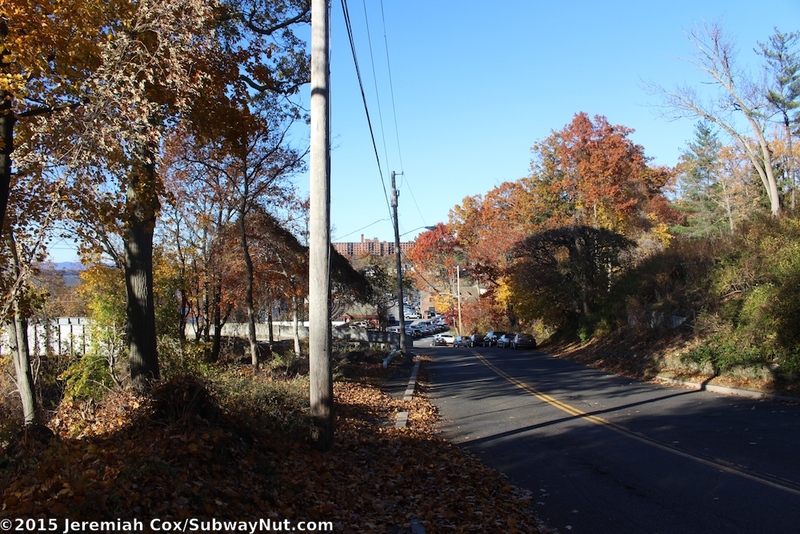 It is primarily owned by the Village of Braircliff Manor that manages the lot with permit parking only, costing $675 a year for residents and $1,200 for non-residents. During the station's reconstruction that reduced the number of parking spaces valet parking was instituted to accommodate all cars. Today valet parking continues to accommodate more cars than the 309 that could be accommodated by self-parking. 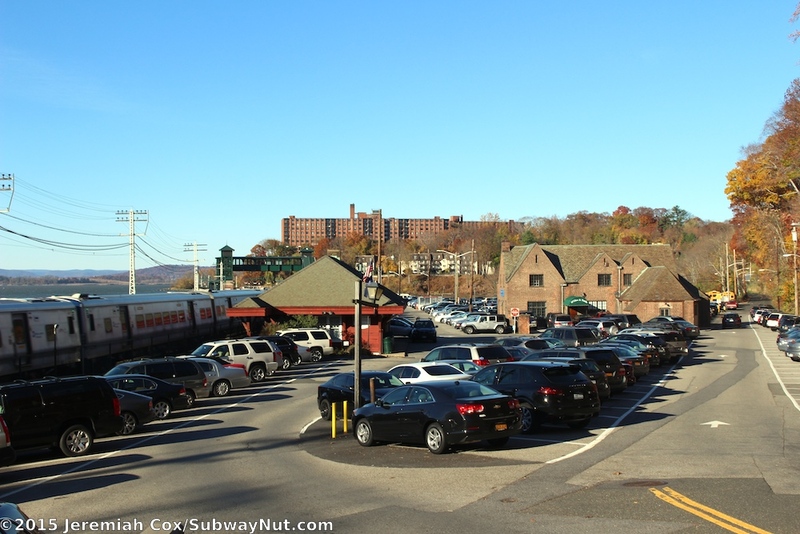 A rear parking area with 111 spaces, costing about $8 a day is privately run by the Braircliff Bus Company that also parks school buses and is behind the main parking lot. Towards the southern end of the station's wide parking lot is the historic station house built circa 1898. It is a wooden red building along the station tracks. It contains the Scarborough Branch of the Post Office for Braircliff Manor. 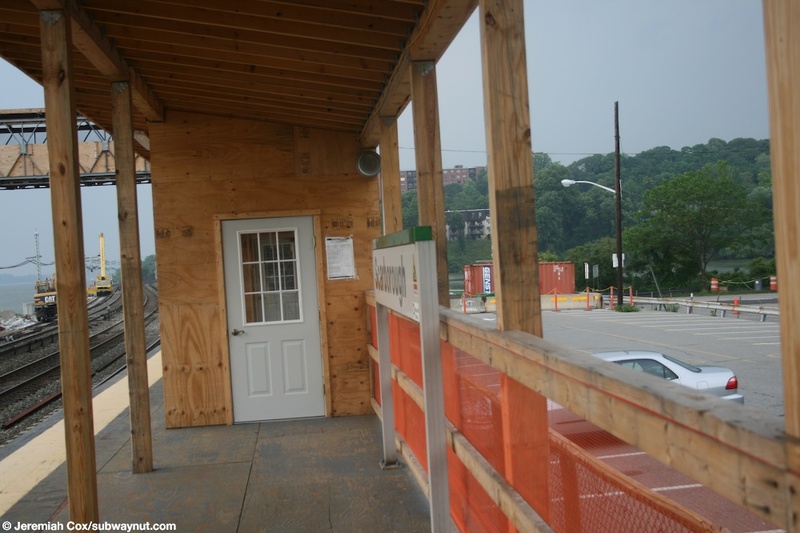 Porches extend on either side of the station house covering what was once the original low-level platform. 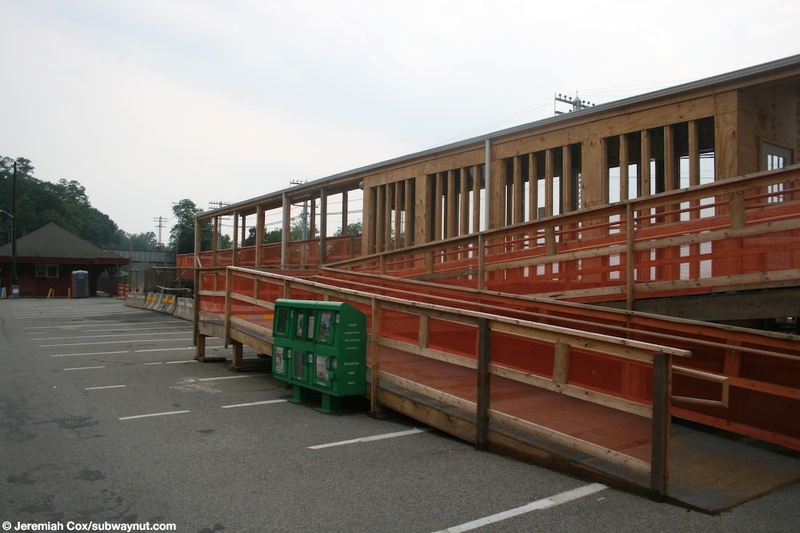 Looking up to the very temporary wooden platforms at Scarborough from what looks like a much smaller parking lot then the station usually has. 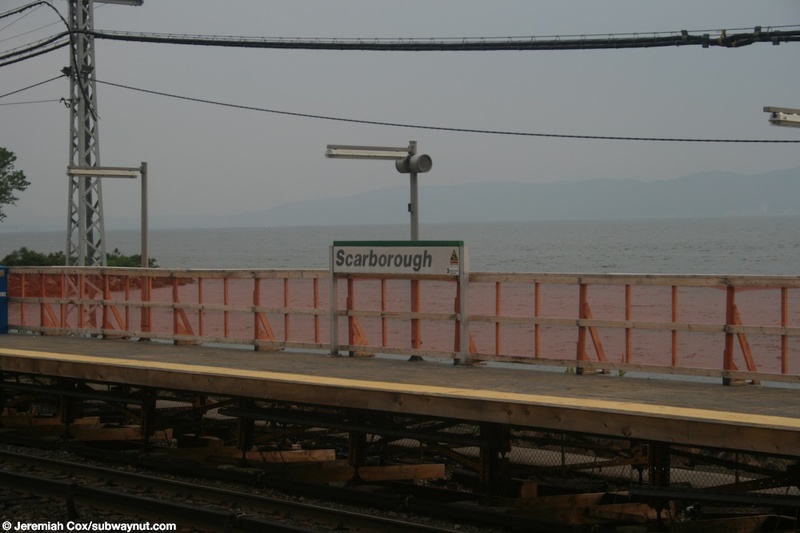 A small orange sign saying To All Trains and Ticket Vending Machines up to the Croton-Harmon platform at Scarborough. 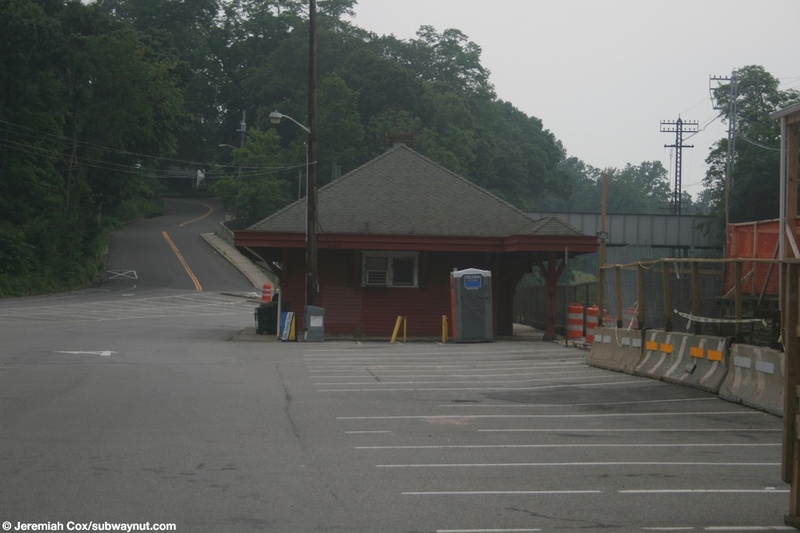 Looking down the parking lot towards the now unused station house at Scarborough. A wooden probably quite rickety ramp up to one of the temporary platforms at Scarborough. 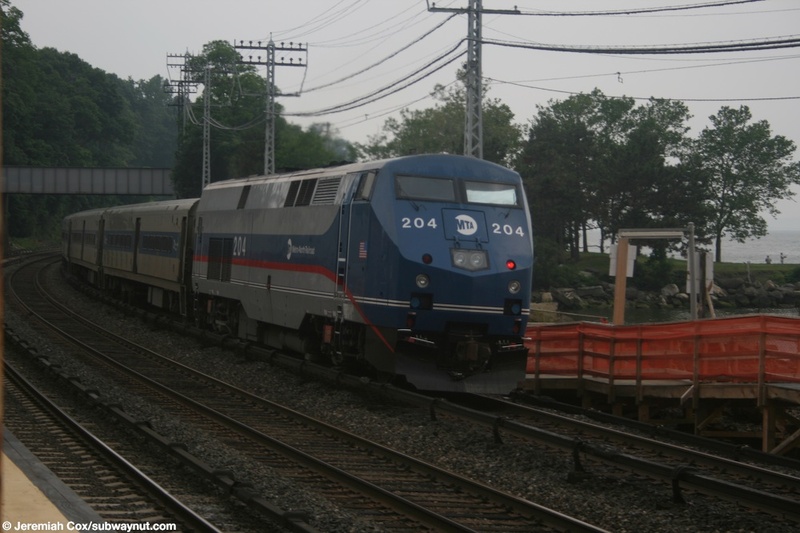 The side of MNR Genesis P32AC-DM #204 pushing an express train to New York through Scarborough. 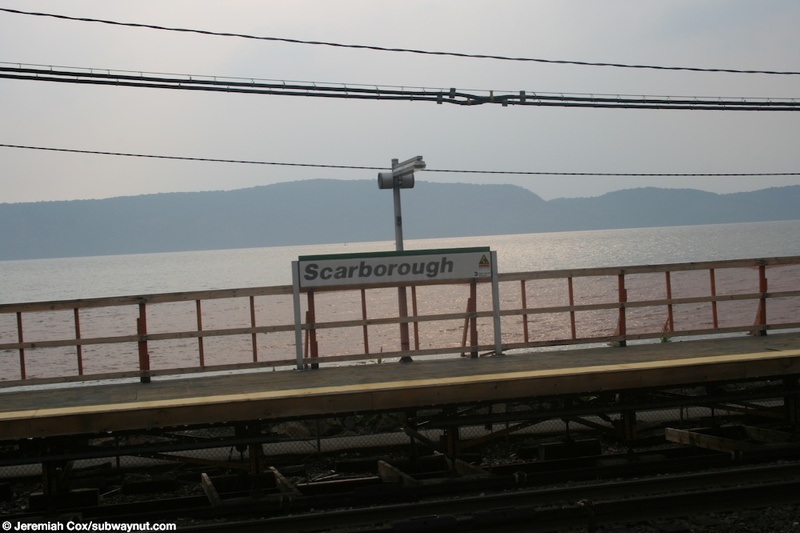 A Scarborough station sign with the Hudson River as a backdrop on the New York platform, that platform has no coverings or benches what so ever. 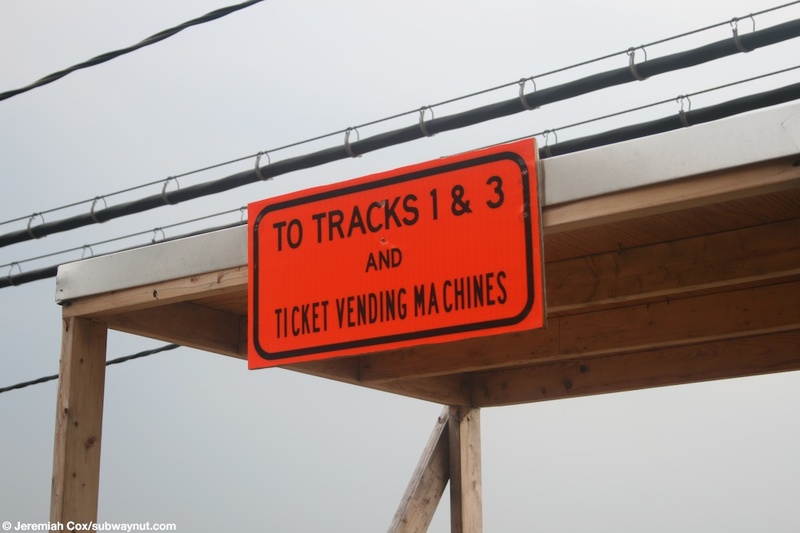 Currently only three tracks are in service through Scarborough, construction equipment of the new platform occupies the fourth track. 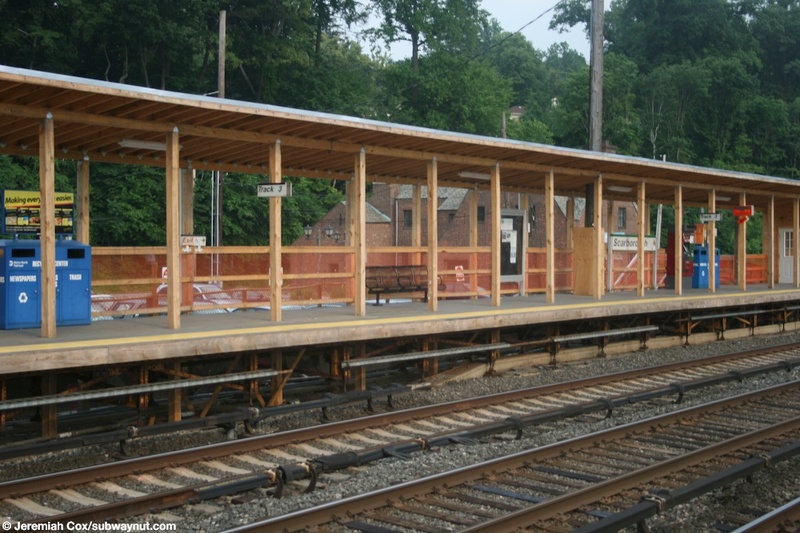 Looking across to the Croton-Harmon platform at Ludlow with its wooden canopy with lots of supports and its small enclosed station area. Another orange construction sign at Scarborough, its above the threshold up a canopied staircase up to the very temporary looking overpass. 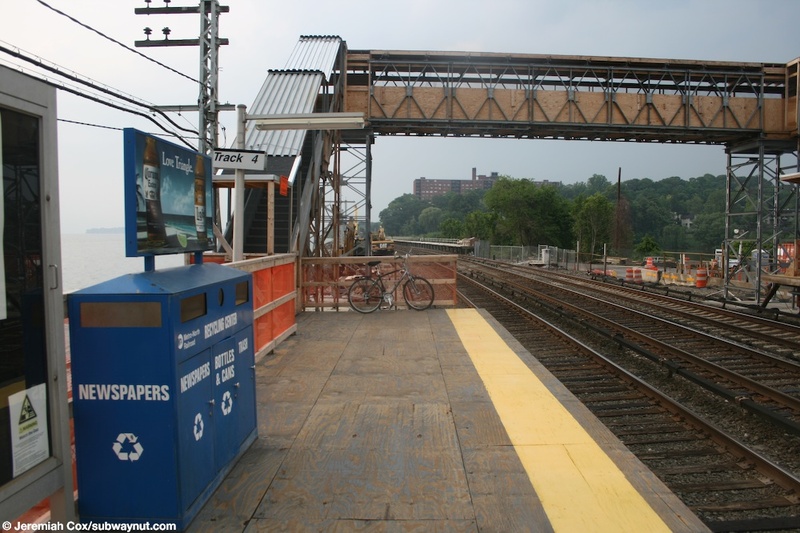 The very temporary overpass viewed from the New York platform at Ludlow. 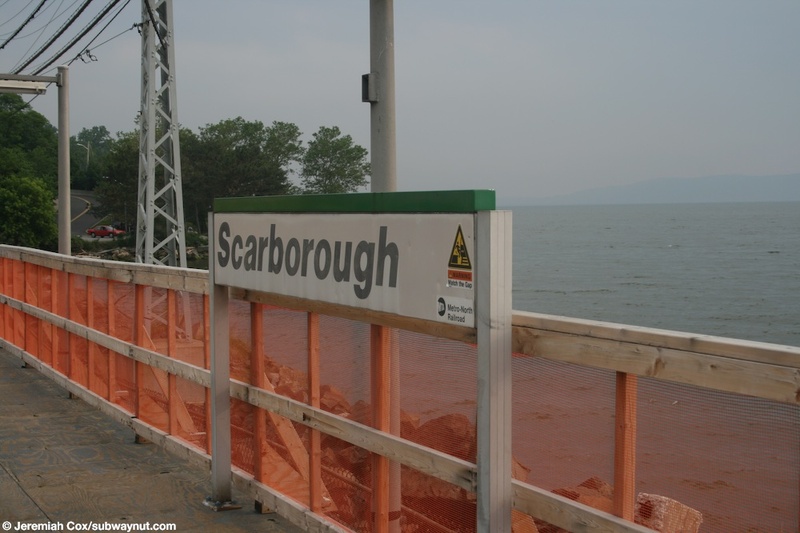 A close up of a station sign at Scarborough with the mighty Hudson just beyond the orange construction mesh.